Two all natural body scrubs from Naki Nagi! I am a native New Yorker, and I currently live on Roosevelt Island. I graduated from New York University with a Bachelor of Science in 2005 in Nutrition & Food Studies, and returned to NYU's Stern School of Business to complete my MBA in Marketing & Business Analytics in 2011. After graduating from Stern, I did not want to simply work at a desk in an office - I wanted to create, to manage, to make decisions and to help people. I have been experimenting with body scrubs for a while now, testing them on friends and family with various skin types, and I created a unique formula that exfoliates and nourishes, without excess oil or drying. In August 2011 I decided to launch Naki Nagi, a handmade body scrub company that allows me to use my culinary training and business education to create a company and a product that I know you will love. Naki Nagi [pronounced Na-Kee Na-gee] is a combination of the Hebrew word "Naki", meaning clean, and "Nagi", the Russian word for legs. The name blends the cultures that define me, Jewish and Russian, with my love for my two Siberian cats - Mishka and Gorbie (short for Gorbachev)., who happen to have the fluffiest, "Naki Nagi" (clean legs).. Naki Nagi represents a unique combination that results in a one-of-a-kind handmade body scrub made with love and appreciation for its ingredients and formulation. 2. What made you decide to begin making body scrubs? When did you get started? In December 2010 I was walking around the Bryant Park Holiday Market, looking for a gift for someone who loved soaps and soap-related products. 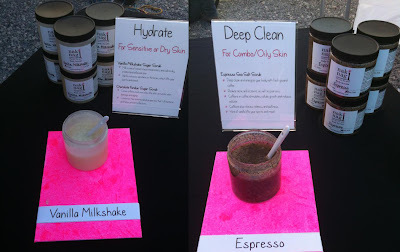 I came across a store that had delicious-smelling pastel-colored body scrubs – for $30 a jar! Exfoliating your body with natural ingredients should be a daily, not an exclusive and expensive, ritual – and I instantly knew I could create something better, more affordable, and more approachable for women and men. I began experimenting at home, trying different recipes and ingredients in an effort to create a scrub that could be used on all skin types, that provides just the right amount of moisture without excess oil (something that bothered me about other body scrubs). After graduating from Stern in May, and being largely uninspired by the job market, I decided to take the ultimate MBA challenge and start my own business in August 2011. 3. Do you have any materials or scents that you'd say are your favorite to work with? I think my favorite scent has to be the fresh ground espresso - the smell, the texture, the amazing exfoliation - my hands feel amazing after I am done producing my Espresso scrub! I am also beginning to experiment with a "Half & Half" idea, in which I mix sea salt and sugar...but I am still working on the consistency of that one - stay tuned! There's no hiding it - I love my cats. Mishka and Gorbie are both Siberian cats (who by the way can grow up to 25 lbs of sheer muscle), and they are the most loyal, loving, soothing and inspiring animals. I work a lot from home, and watching the two of them interact is hilarious. I take them for walks outside (on their leashes), they chase each other up and down the hallway, and snuggle together in bed. They are the inspiration behind Naki Nagi. 5. Do you have any advice for others that are looking to make a business out of selling their work? Don't give up. I know it sounds cliche, but you will have really bad days where you sell nothing, and great days when you sell a lot. Sales is probably the hardest part of any business - but if you believe in yourself and your product, you will make it through. 6. What's your favorite ice cream flavor? Congratulations to Maggie and thanks again to Rachel from Naki Nagi for these fantastic scrubs and for helping to support our 12 Days of Christmas. Woohoo!! I can't wait to try these out!